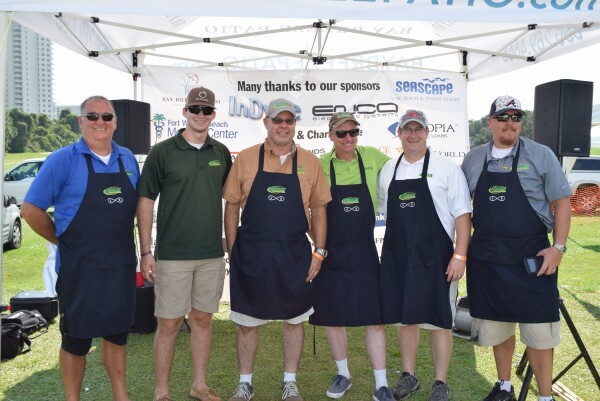 The fourth annual Eggs on the Beach, official Big Green Egg festival, drew record participation and resulted in some big winners. Beauchamp Commercial featured above earned the first place Judges Award. Beauchamp Commercial was awarded the Judges First Place Trophy and Saltwater Restaurant Group earned first place Tasters’ Choice Award. The Air Commando Association was the top non-profit team winner. 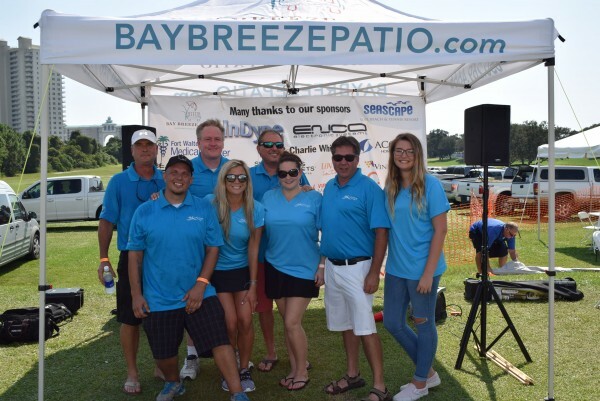 Eggs on the Beach, presented by Bay Breeze Patio, celebrated foods cooked on the Big Green Egg. 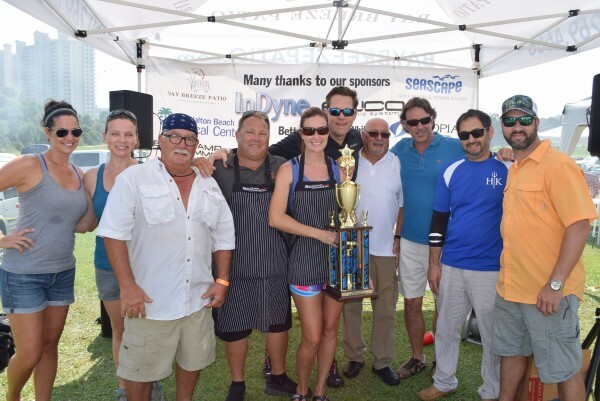 On Saturday, Sept. 30, more than 30 cook teams competed, presenting their best recipes on a beautiful Saturday at Seascape Resort. 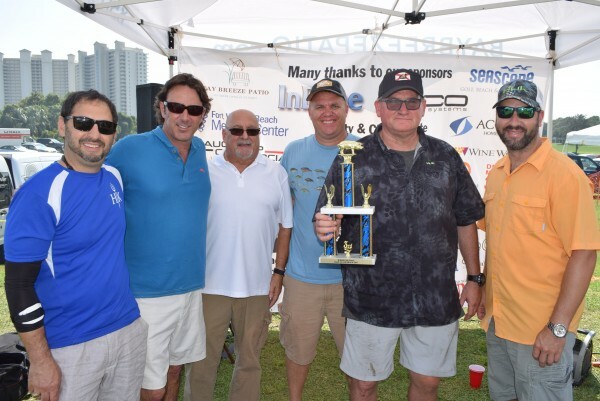 The Gulf on Okaloosa Island featured above earned the 2nd place Judges Award and Smokin’ Nuts earned 3rd. Distinguished chefs from area restaurants and a cookbook author represented the group of honorary judges who awarded trophies based on flavor, presentation and creativity. Beauchamp Commercial earned the Judge’s first place Judges’ Award Trophy for their Trigger Fish tacos with homemade mango slaw. 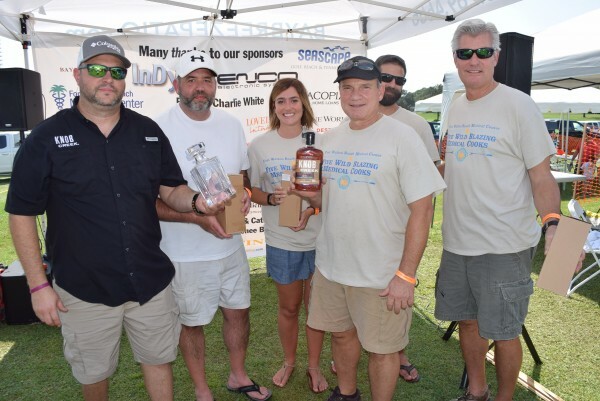 The Gulf on Okaloosa Island earned the second-place trophy with their smoked brisket with fig BBQ, pickled peppers and coriander, and Smokin’ Nuts earned the third-place trophy for Hal’s Pork ‘N Beans with Knob Creek Bourbon, bacon, peach, and sweet onion beans topped with smoked pork belly. Saltwater Restaurant Group featured above earned the Taster’s Choice Grand Prize and InDyne earned 2nd place Taster’s Choice. 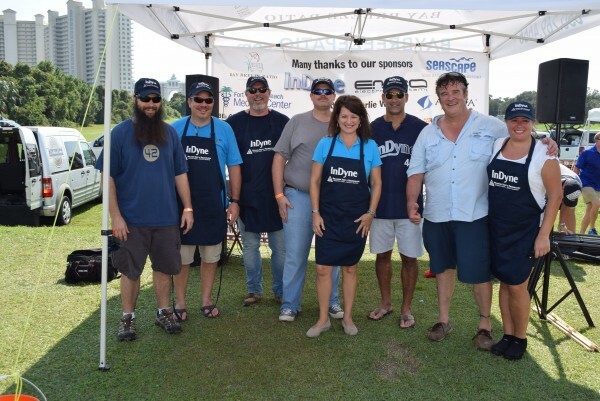 The Tasters’ Choice Award was presented to Saltwater Restaurant Group for their sea scallops with smoked marinara sauce, filet mignon with Knob Creek maple-bacon glaze and Kentucky Mule with Knob Creek Bourbon. Second place Tasters’ Choice Award went to InDyne-RT&T who prepared grilled oysters and grilled shrimp with Cajun BBQ sauce on a grilled baguette. Earning third place Tasters’ Choice, Beauchamp Commercial served Trigger Fish tacos with mango slaw. 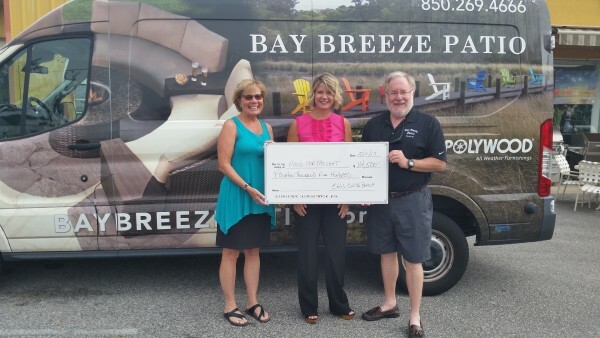 Local non-profit organizations earned $6,000 in donations, including $3,000 for 1st, $2,000 for 2nd, and $1,000 for 3rd. 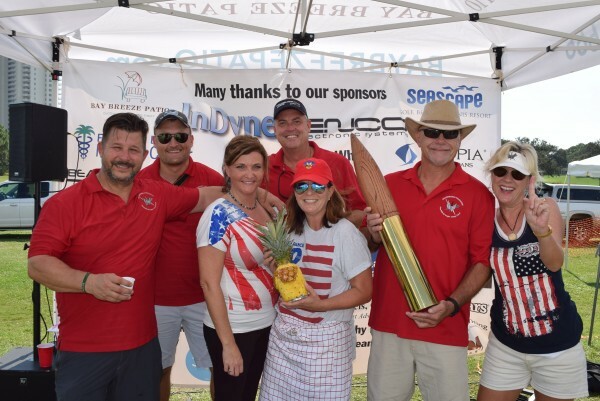 The leading team in the non-profit category was Air Commando Association, earning a $3,000 donation toward their cause with their marinated chicken thigh topped with siracha mayo, grilled pineapple and swiss on Naan bread. 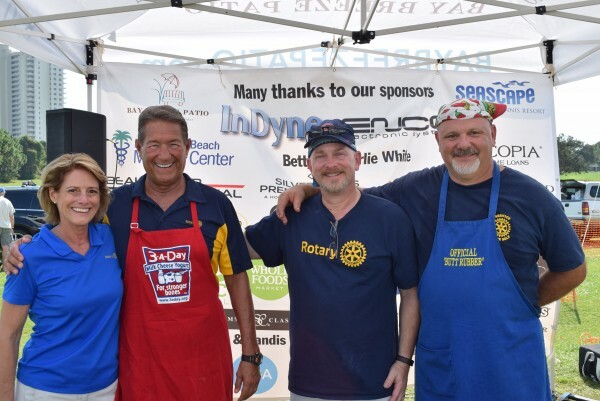 Earning second place in the non-profit category, the Rotary Club of Destin presented SHISH-KA-KNOBS, chicken skewers with raspberry, habanero and Knob Creek sauce. 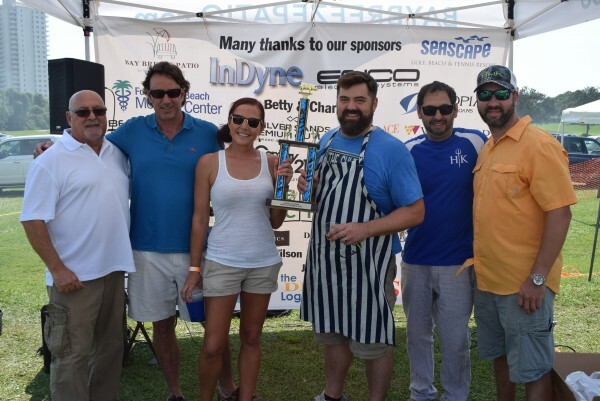 In third place, Brock lawn & Pest Control earned $1,000 for Fisher House of the Emerald Coast with their coveted pork with pineapple recipe. Knob Creek Winners infused Knob Creek Bourbon in their recipe. 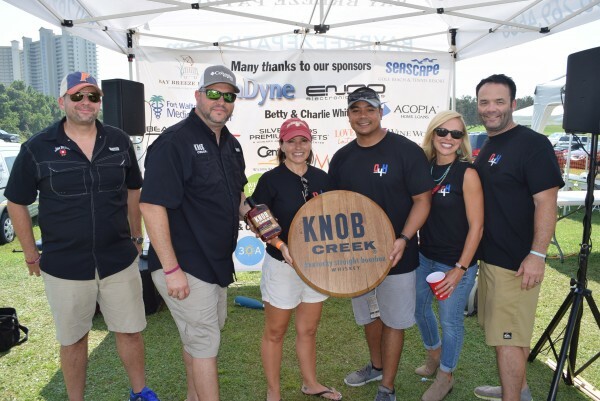 The top competitors who infused Knob Creek Bourbon in their recipes were Fort Walton Beach Medical Center and Oxygen4Heroes. The final award was presented to Saltwater Restaurant Group for best décor. 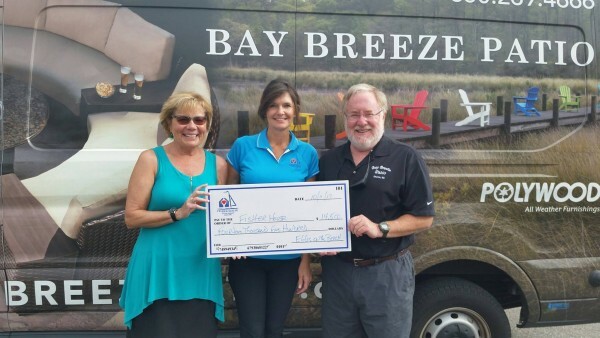 Eggs on the Beach raised $35,000 for local non-profit organizations, including $14,500 for BOTH the Fisher House of the Emerald Coast and Food for Thought. Located on Eglin Air Force Base, the Fisher House provides a “home away from home” for military families during treatment for serious illness or physical/occupational therapy. Food for Thought helps fight food insecurity by providing backpacks filled with healthy snacks for nights and weekends.